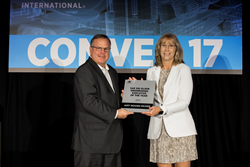 SAE International announces that Amy Moore-McKee, Director of Engineering with Caterpillar, Inc., is the 2017 recipient of the of the Sid Olsen Engineering Executive of the Year Award. In her role with Caterpillar Inc., Moore-McKee leads over 300 design engineers in the development of Caterpillar’s wide range of mining products. Moore-McKee was presented with the the award at the SAE 2017 COMVEC (Commercial Vehicle Engineering Congress) in Rosemont, Ill. The Sid Olsen Award recognizes an outstanding engineering executive in the off-highway industry. Candidates are nominated by their employees, colleagues, supervisors, or the local SAE International Section, with the nomination supported by another individual from the same group (e.g. employees, colleagues, supervisor or SAE International Chapter). The award honors Sid A. Olsen, an SAE International Fellow and industry leader who actively supported and participated in leading industry activities. In her role with Caterpillar Inc., Moore-McKee leads over 300 design engineers in the development of Caterpillar’s wide range of mining products. Prior to this role, she was the World-Wide Product Manager for Large Track-Type Tractors, where she led the engineering, commercial and product support teams for the D9, D10 and D11 bulldozers, the largest of their kind in the world. Moore-McKee has traveled the world, supporting customers in Saudi Arabia, Russian Far East, Brazil, Europe, Canada and Australia. Prior to that, she was Technical Manager for the Large Tractor Engineering team, leading Tier 4 and semi-autonomous development. Her other roles at Caterpillar include leading the revolutionary D7E electric drive tractor from early concept through to production readiness; and Commercial Manager for Cat Electronics. She has written engine software that runs on all of today’s Caterpillar engines. She holds six patents with Caterpillar Inc., and one with Motorola. Moore-McKee earned a Bachelor of Science degree in Computer Science from the University of Illinois, Urbana-Champaign. She is a FIRST Robotics judge, a Friend of CASA (Court Appointed Special Advocates) and a member of the Society of Women Engineers, from which she received the SWE Outstanding Engineer Award in 2016. She also is a board member of Caterpillar’s ADEPT (Abled and Disabled Employees Partnering Together) employee resource group, a member of CAAN (Caterpillar African American Network) & WIN (Women’s Initiative Network) and a featured panelist for Women In Leadership.